The peasant is the life-spring of our Reich and our race. Thus did Walther Darré, Minister of Agriculture and Food Supply, concisely state the Nazi attitude toward the land and those who work it. Blut und Boden! 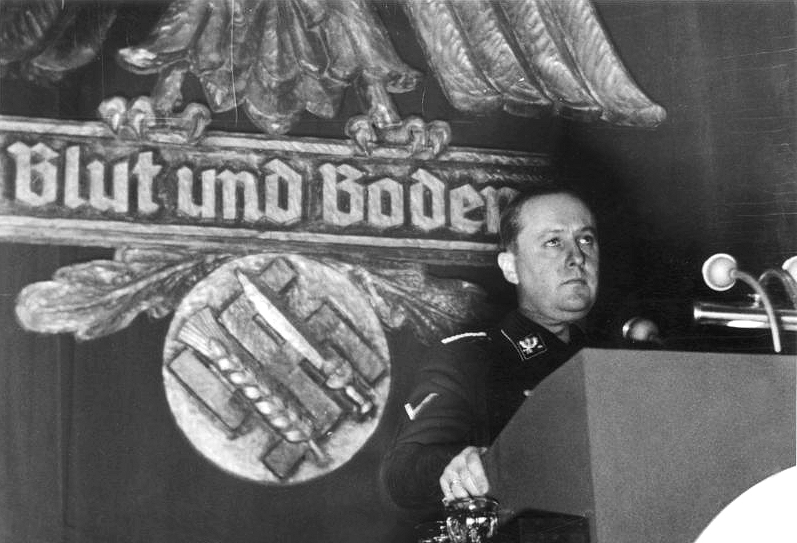 “Blood and Soil!” That is one of National Socialism’s key slogans. Nowhere has this revolutionary regime undertaken more daring and original experiments than upon the land itself. Of that I was aware when I came to Germany, so I was anxious to study this challenging phase of German life by first-hand observation. The Minister was more than willing to assist. This big, energetic, good-looking man is one of the most interesting personalities among the Nazi leaders. As his name indicates, he descends from Huguenot ancestors who came to Germany three centuries ago. Furthermore, as I have stated, he was born in the Argentine. The son of a wealthy German resident, he spent his early life in South America. He is well qualified for his job, since he is an expert on agriculture and stockbreeding. I have already quoted Dr. Darré on the food-card system now in operation*. However, in our conversations, he repeatedly emphasized that this was merely part of a much larger organic whole which far transcended the war. Here is how he summarized National Socialism’s agricultural aim and policy: “When we came to power in 1933, one of our chief endeavors was to save German agriculture from impending ruin. However, our agricultural program went far beyond mere economic considerations. It was based on the idea that no nation can truly prosper without a sound rural population. It is not enough that the farmers shall be tolerably well-off; they should also be aware of their place in the national life and be able to fulfill it. Here are the three big factors in the problem: First, to assure an ample food supply; second, to safeguard the future by a healthy population increase; third, to develop a distinctive national culture deeply rooted in the soil. 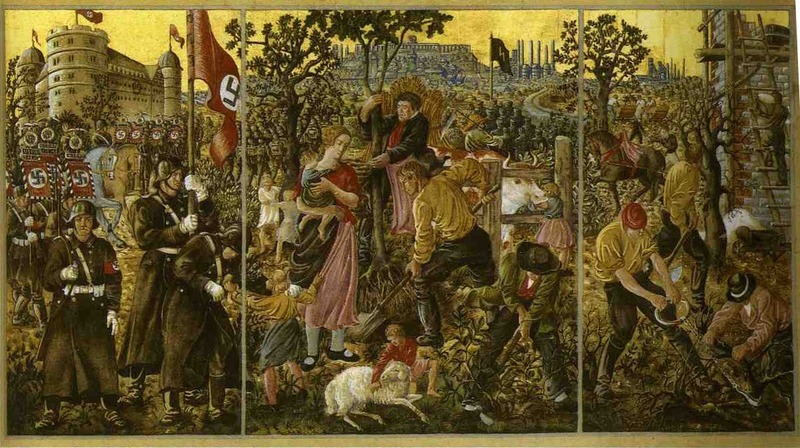 This ideal logically implies an aim which goes far beyond what is usually known as an agrarian policy.” These factors were dealt with by three important pieces of legislation passed shortly after the Nazis came to power. They were: (1) The National Food Estate; (2) The Hereditary Farmlands Law; (3) The Market Control Statute. The Food Estate is a gigantic quasi-public corporation embracing in its membership not only all persons immediately on the land but also everyone connected with the production and distribution of foodstuffs. Large landowners, small peasants, agricultural laborers, millers, bakers, canners, middlemen, right down to local butchers and grocers — they are one and all included in this huge vertical trust. The aim is to bring all these group interests, previously working largely at cross-purposes, into a harmonious, co-ordinated whole, concerned especially with problems of production and distribution. The Market Control Statute links all this with the consumer. The aim here is a thoroughgoing, balanced economic structure based on the principle known as the “just price.” Everybody is supposed to make a profit, but none are to be out of line with the others. Furthermore, the ultimate consumer is to be protected from profiteering. The Hereditary Farmlands Law revives the old Teutonic concept that the landowner is intimately linked to the land. It is officially stated that “The idea engendered by Roman law that land was so much merchandise to be bought and sold at will is profoundly repugnant to German feelings. 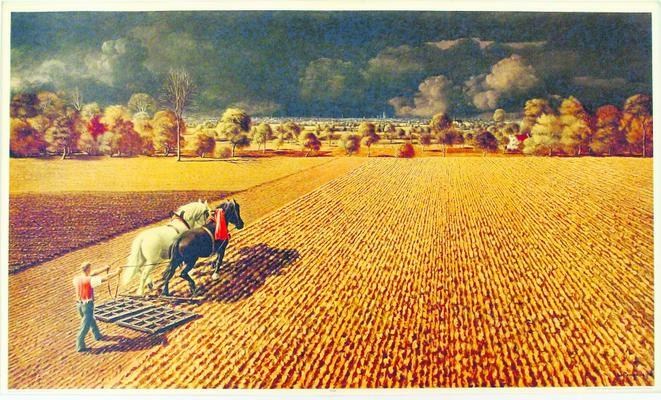 To us, soil is something sacred; the peasant and his land belong inseparably together.” Emphasis is thus laid on the Bauer, imperfectly translated by our word peasant. The German Bauer is an independent landowner, self-respecting and proud of the name. We can best visualize him as like the old English yeoman. This is the class which National Socialism seeks to foster by making peasant holdings hereditary; keeping the farm in the family, and keeping it intact by having it descend through the oldest son. That was the old Teutonic method, which still prevails by custom in parts of Germany. Over 700,000 of these hereditary farm holdings have now been established. They cannot be sold or mortgaged; neither can a creditor seize the crop for the owner’s personal debt. To qualify as a hereditary peasant, however, a man must be of German blood and be able to manage his property. Title to the land is thus not absolute; it is rather functional in character. This type of peasant is most numerous in Northwestern Germany. In the eastern provinces, great estates predominate. In Southern Germany, on the contrary, where farms have customarily been divided among all the children, holdings tend to be too small. The Nazis consider either extreme economically and socially unsound. They therefore seek to split up the big estates into moderate-sized peasant farmsteads, and combine small parcels into normal units. They are not trying to rush things, but considerable progress has been made along both lines. As usual, the Nazis have tried to enlist psychology in their agricultural endeavors. The Bauer’s traditional pride is flattered in many ways. He is extolled as the Third Reich’s “nobility of the soil”; the vital well-spring of national life. Everything is done to encourage his corporate spirit, from reviving costumes and folk-dances to an annual Peasant Congress and a gigantic festival on the historic Bueckeberg. The Nazis frankly admit that mere planning and regulation from above, no matter how efficient, will not attain the desired goal — a flourishing agriculture which will feed the whole nation. Not unless the rural population is inspired to do its utmost will the experiment succeed. It is this psychological aspect which Nazi spokesmen have in mind when they speak of the Inner Front. As Darré told me: “We saw from the first that we could not reach our goal through state action alone. We needed the help of the organized farmers to put it over.” Such was the theory. How was it working out in practice? “See for yourself,” said Dr. Darré. He thereupon proposed that I make an investigation trip through what he considered the most instructive region — rural Westphalia and Oldenburg. There I would see in successful operation an agricultural system and way of life basically unchanged since the Middle Ages. It was upon this system, adapted to modern conditions, that the National Socialist Government had framed its land laws, which it intends ultimately to extend throughout the Reich. I would thus see a sort of working model for a hoped-for future. A few days after this conversation I left Berlin for the projected tour, accompanied by one of the Minister’s right-hand men. He was Dr. Friedrich Sohn, a leading agronomist who had also studied agricultural conditions in America and had done special work in the Brookings Institution at Washington. He could thus compare German and American agriculture in a most useful way. As usual, an elaborate schedule had been drawn up for a comprehensive survey, with many stops to visit farms, large and small, and ample time to chat with the owners, look over their livestock, and examine methods of cultivation. A shy man, Dr. Sohn handed me the typewritten schedule rather anxiously. “This means that we’ll be going every day from dawn till after dark,” he said with a deprecating smile. I assured him that was all right with me, as I wanted to make the most of this trip. This cheered him up no end. Germans really like hard work, and they seem always delighted when a foreigner is willing to hit the same pace. We left Berlin by train just after lunch and journeyed westward via Hanover to Minden, where we were to spend the first night. We arrived after dark. The railway station is some distance from the town itself, so we had to rustle our bags through the misting rain to a waiting tram almost tiny enough to pose for a model of the famous Toonerville Trolley. On our way, we nearly ran over a drunk who had chosen the space between the rails for his couch. The motorman heaved the sleeper impatiently to the roadside and kept on, reporting the incident to a policeman on post as we entered town. We stopped at a little hotel decorated in the plush splendor of the 1870’s. They dine early in the provinces, so when we got to the dining room it was almost empty except for one large Stammtisch in a far corner. About that table sat a dozen big, blond men smoking fat cigars and drinking from generous steins of beer. Our meal confirmed what I had already heard about the less stringent food regulations in the small towns. It was a meatless day, but I rejoiced to see egg dishes on the menu. I hastened to order fried eggs, “sunny side up,” and got two big beauties. The fresh yolks beamed at me from the blue-bordered plate. Those were the first eggs I had seen in Germany since the Press junket; but those had been rather “off the record” while these were evidently a matter of course. I was still more astonished to see a nice piece of fried ham nestling beside the eggs, while the next instant my waiter placed a pat of butter on the table, with no request for my foodcard. I looked inquiringly at Dr. Sohn. “Out here they don’t bother much about such matters,” he smiled. After dinner, the head of the local Bauernschaft, or Peasants’ Organization, came to pay his respects and talk over the trip planned for the next day. Like most of these officials, he was an obvious countryman. The Bauernschaft is really run by “dirt farmers.” We breakfasted early and entered the motor car ordered for us just as the late autumn dawn was breaking. It was a small sedan, through the windows of which I caught charming glimpses of historic Minden with its crooked streets and gabled houses. The day was cold and cloudy. By the time we had reached our first scheduled stop, I was somewhat chilled. This was the town of Enger, where we were to do a bit of sightseeing — but with a practical purpose. Here is the burial place of Widukind, the legendary Saxon chieftain who for so long withstood the might of Charlemagne. The Nazis have glorified Widukind as a popular hero, defending primitive Germanism and the old gods against Karl the Great who is described as a Latinized Teuton seeking to impose upon the Saxons the yoke of a revived Roman Empire and an equally alien Roman faith. That, at least, is the thesis of the handsome little booklet given me when I visited the new Widukind Memorial, half museum and half shrine. The booklet also states that, long after the Saxon nobles had lost heart and given up the fight, the tribal masses stood by their patriot hero to the death. Perchance the intent is to suggest a primeval Fuehrer? We were now well into rural Westphalia, and our investigations had begun. But before relating details, let me sketch in the background. The districts I was to visit all lie in what is undoubtedly the most Teutonic part of Germany. From Westphalia northward to the North Sea Coast and the Holstein peninsula to the Danish border stretches the region which can perhaps best be called Old Saxon-Land. This region should not be confused with the modern province of Saxony, which is far to the southward and has no historical connection. What I refer to as Old Saxon-Land is the primeval home of those Teutonic tribes some of whom migrated oversea and conquered Britain. It is interesting to note that the old blood still shows in the present population. A large proportion of the peasantry have long heads and faces, ruddy blond complexions, and frames which, though tall and muscular, are seldom rotund or thickset. Such persons could very easily pass for English rural types. Some of them, indeed, with different clothes and haircuts, would look quite like old-stock Americans. For the American visitor, the general aspect of this region has a familiar look. In other parts of Germany the rural population lives in villages. Old Saxon-Land, however, is throughout a country of detached farms. Each family lives on its own holding, entirely separate from its neighbors. This, indeed, typifies the traditional spirit of the folk. The Old Saxons have been, and for the most part still are, independent land-holders. There are relatively few large estates held by noblemen. The region is predominantly inhabited by a landowning peasantry. Within itself, this peasantry varies considerably in economic and social standing. At the top stand large farms of two hundred acres or more, while the smallest holdings are only a few acres. Most of the large farms are worked, not by temporary hired labor, but by tenant farmers. The relations of these tenants to their proprietors are highly personal and are regulated by contracts and customs going back to ancient times. Some tenant holdings have been in the same family for generations. 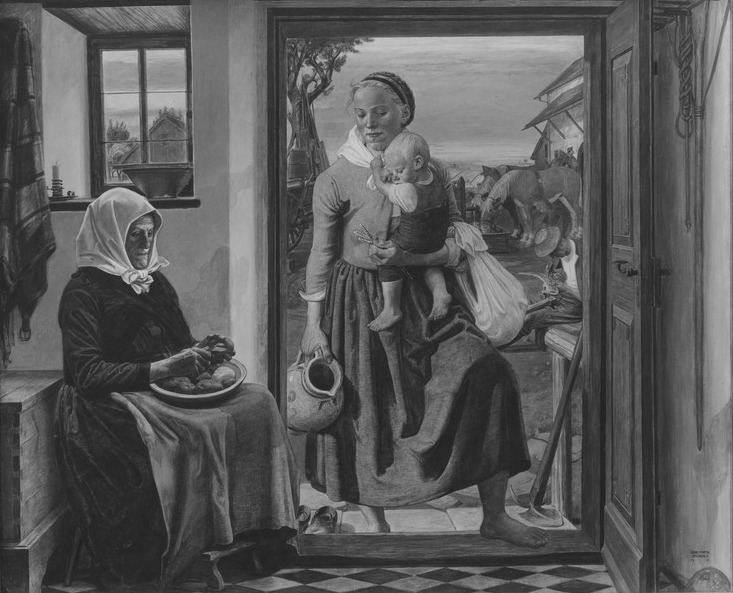 The agricultural system and way of life in Old Saxon-Land cannot be understood unless we realize that these people, no matter what the size of their holdings, all feel themselves to be fellow-peasants. Even the wealthy owner of many acres and proprietor to several tenants is very much of a dirt farmer. He probably has been away to school and possesses a good education. Nevertheless, he works with his hands, wears farm clothes and wooden shoes, and is just as close to the soil as anyone else. He has no wish to be a nobleman or even a “squire” in the English sense. However, he has a deep though unobtrusive pride in himself and his place in the world. With good reason, too; for in many cases his forebears have been leaders in the local community since time immemorial. One big farm I visited, which had been in the same family for over five centuries, had been continuously cultivated with scant change in boundaries ever since the year 960 A.D. — more than a hundred years before the Norman Conquest of England! The quiet dignity and mellow beauty of these old farmsteads must be seen to be appreciated. They consist of a number of buildings ranged about a courtyard, whence their German name of Hof. They are always built of timbered red brick, though the timber patterns differ from one district to another. As you enter the courtyard, you have directly in front of you the main building — an impressive structure with high-pitched roof running down to within a few feet of the ground. This building is very long; sometimes well over a hundred feet. It houses both the master-farmer and his animals. When you enter the great doorway you find cows and horses stalled on either side. Only the malodorous pigs are today usually relegated to other quarters, though formerly they lived there too. At the rear of the farmstead are the family living-quarters. In olden days there was no partition between, so the master-farmer could survey his livestock directly from his great bed and watch the work going on. Today, the living-quarters are walled off from the barn itself, though with handy access through one or more doors. Back of the living-quarters lies a moderate-sized pleasure garden, filled with shrubs and flowerbeds, and usually walled in by high hedges. 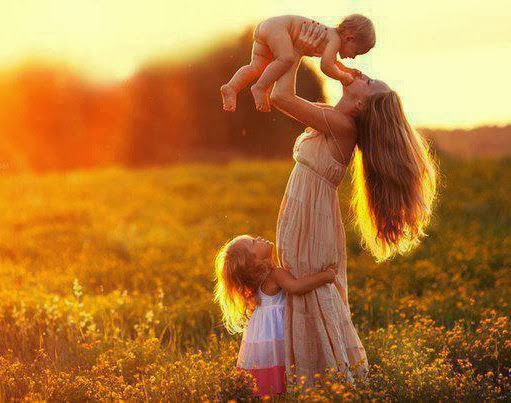 Here the family take their ease on summer evenings. The smaller farmsteads are built on precisely the same lines as the great Hofs, though everything is on a lesser scale. In the old tenant farmsteads conditions are decidedly primitive. The living-quarters are not merely under the same roof; they are right in with the animals. Yet even here I found no filth or squalor. The air might be pungent with the smell of cows and horses, but the rooms were always neat and clean. Maier Johann awaited me as my motor car drove in through the outer gate of the farmstead and stopped in the middle of the wide courtyard. The yard was surrounded by buildings of timbered brick. Indeed, the yard itself was paved with brick, liberally coated with sticky black soil tracked in by wagons, men, and animals. My host stood in the great doorway of his Hof, his ancestral abode. Maier Johann is a wealthy man, as wealth is reckoned in those parts. He owns over two hundred acres of rich land, most of it under crops though with some pasture and woodland. His ancestors have owned it for nearly eight hundred years. From the first glance it is clear that he is a good manager. Everything is well kept up. The front of the Hof is a sight in itself. From the high-pitched roof to the ground, this front is elaborately carved, and those old carvings are painted in many colors. From them you learn that the present Hof was built in the year 1757. There is a curious mixture of pious Christian texts and symbols coming down from heathen times — sun, moon, stars, the signs of fertility, and black ravens for good luck. On the massive oak timbers of the doorway, wide and high enough for hay wagons to drive in, are carved and painted the Norse Trees of Life, together with symbolic serpents to guard the humans and animals dwelling inside from evil spirits that might seek to intrude. My host is a Maier. That is not a family name. It denotes his rank, and has the same significance as the original meaning of our word “mayor” — leading man in a community. The farmstead is thus a Maierhof. But he is not merely a Maier, he is a Sattelmaier. That means a leading man on a fully-caparisoned horse; in short, a man-atarms, who ranked next to a knight in Feudal times. It is the very tiptop of the peasant hierarchy. Only a few Sattelmaiers are to be found in this countryside. When a Sattelmaier dies, the bells in the parish church toll for an hour in a special way. The coffin containing the deceased is taken to the church in a wagon lined with straw and drawn by six horses. Behind the wagon paces the dead man’s favorite steed, led by the oldest of his tenant farmers. During the funeral service, the horse looks in through the open church door, and he also inspects the grave while his master is laid to rest. On such occasions the whole countryside turns out to pay final honors. These curious ceremonies have not been described merely to make a quaint story; they typify the spirit of this conservative yet virile folk. The proudest Sattelmaier is neither nobleman nor squire. He is a peasant — a master-peasant, if you will, yet still a peasant — the first among basic equals. Of this, Maier Johann was a good example. He knew I was coming to see him, but he had made no attempt to “dress up.” So he met me clad in an old hunting-cap, heavy farm clothes, and wooden shoes flecked with mud from work about the stables. A tall, fair man, ruddy from a life spent in the open, he led me through the doorway into the long barnlike Hof, lined with cow-stalls on one side and horse-stalls on the other. The brick floor was partly covered by a pile of hay from the loft above and heaps of green fodder. The loft flooring was supported by massive oak beams two feet thick, hand-hewn and dark with age. At the far end of the barn was a wooden partition, walling off the living-quarters. Into these we passed through a low door, and I found myself in a hall stretching the width of the Hof. This hall contained several pieces of massive furniture, obviously family heirlooms and elaborately carved. The doors and wainscoting were carved in similar fashion. On the walls hung several portraits of army officers. My host explained. “This,” said he, pointing to the framed sketch of a bearded man in a hussar uniform, “is an ancestor of mine who was killed in the Danish War of the 1800’s.” He pointed again: “Here is a relative who fell before Paris in 1871.” Again: “This is my uncle, killed in the World War.” He made no mention of an excellent likeness of himself in officer’s field-gray. The earlier portraits were especially interesting to anyone who recalls the caste spirit of the old Prussian Army. They revealed perhaps better than aught else the peculiar social status of the Sattelmaier — a master-peasant who was nevertheless eligible to a commission alongside noblemen and gentlemen. One other portrait hung on the wall: a painting of a very old man with shrewd blue eyes twinkling behind features withered like a red apple. My host smiled almost tenderly. “A Heuerling,” he answered my unspoken question. “One of our tenant farmers. He died last winter at the age of ninety-four.” Maier Johann was the only Sattelmaier I visited. But he was merely a somewhat wealthier and more prominent specimen of a generalized type. The other master-peasants with whom I stopped were very similar in appearance and character, and their homes were much the same. All of them appeared to be capable, practical men, naturally intelligent and with a fair measure of education; yet never “citified” and always in closest touch with the earth which nourished them. Their homes were free from pretentiousness or cheap modernity; their farms were models of careful husbandry — a good, sound breed. As might be expected, their hospitality was as ample as it was unaffected. Most of all do I remember the country breakfasts — those European “second breakfasts” which are eaten in the middle of the forenoon. Picture me seated in an old room with carved wainscoting and beamed ceiling, heated by a tall tiled stove. Around a long table sit big brawny men and buxom women, eating heartily of the food with which the board is laden. Those viands may sound simple to American readers in our fortunate land of plenty, but to me, fresh from strictly rationed Berlin, they were luxuries indeed. In Berlin my butter ration was about an ounce per day; here was a stack of butter nearly as big as your head! Platters of smoked Westphalian ham and varied sausages, flanked by piles of rye bread and pumpernickel. Best of all, a big platter of hard-boiled eggs fresh from the nest. No food-cards for the folk who produce Germany’s food! The one thing lacking was coffee, for no one in Germany has coffee except invalids, wounded men in hospital, and soldiers at the front. But there were cups of strong meat bouillon, and later on small yet potent glasses of schnapps or brandy to wash down the meal. Then German cigars, mild and quite good, were passed around, and we sat back to chat amid a haze of blue tobacco smoke. It was hard to leave those cordial hosts and their kindly hospitality. Always with regret did I quit the cozy living-room, walk down the long vista of the barn, climb into my waiting car, and wave farewells until the motor had passed out of the Hof gates and taken once more to the road. One of the outstanding features of the agricultural system of northwestern Germany is the tenant farmer. In that region he is called a Heuerling. This is the German variant of our old English word “hireling.” With us, the word has come to have a bad meaning. It signifies a man who has sold himself into some unworthy or criminal service. In German, however, it means simply a hired man, and in Northwestern Germany it applies especially to a peculiar sort of tenancy. 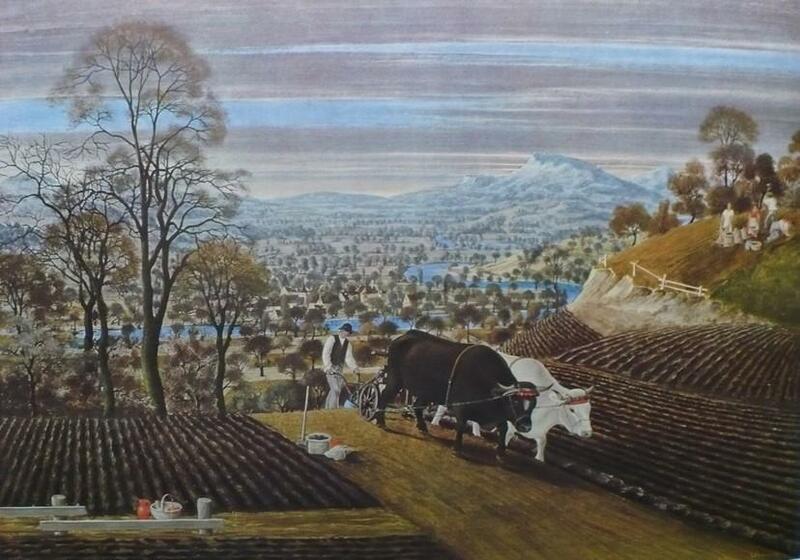 The Heuerling is not a casual or seasonal agricultural laborer. In Northwest Germany, landless, floating farm labor is little in evidence. 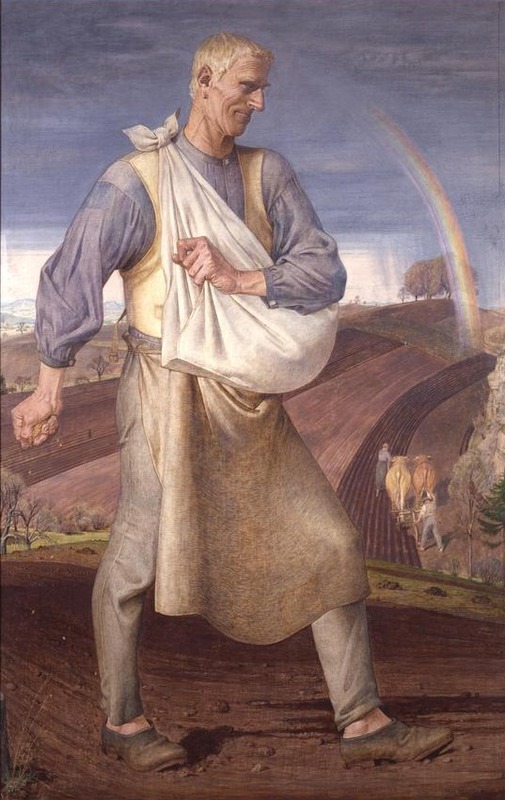 Only since the outbreak of the present war with the consequent enrollment of many young peasants as soldiers has such labor been much needed. For centuries, the Heuerling has supplied the basic answer. The nearest thing we have to him in America is the “hired man” in rural New England, who is usually a farm fixture, often for life. The New England hired man, however, is ordinarily a bachelor, living under the same roof with his employer and virtually part of the immediate family. The Heuerling has a house of his own, together with a small tract of land which he can work in his spare time. His home is a miniature farmstead. Like the spacious Hof of the proprietor, it shelters family and animals under one roof — and in the closest proximity. Those animals are supplied to him by the proprietor as part of the tenancy contract — at least one milch cow and several pigs, to say nothing of poultry. The Heuerling also gets a cash wage. In return for all this he is bound to give the master-peasant who employs him most of his time. A large farm of two hundred acres may have five or six of these tenant households within its borders. I suppose that this system, like every other, has its share of abuses. But from all the evidence I could gather, it seems to work satisfactorily. In the first place, the system is very ancient, and tenancies are made in accordance with long-established custom and precedent. Even more important, there is no class distinction involved. As already remarked, all these folk feel themselves to be fellowpeasants, and they actually work side by side. Their basic social equality is revealed by the way they always speak to one another in the second person singular — the German Du, which implies close familiarity. Another favorable sign is the way these tenancies are cherished. Some tenant farmsteads I visited had been in the same family for generations. Certainly, all the Heuerlings I met and talked with appeared to be upstanding men — simple and good-natured, if you will, yet not a type to be browbeaten or ill-used. The whole system is intensely personal in its relationships. In fact, it is quite feudal, still infused with the spirit of medieval times. The best example of the quaintly feudal loyalty which the Heuerling entertains toward his master-peasant employer is one which came to my attention during a visit to a certain large farmstead. The owner had died suddenly about a year before, leaving a widow, a son only sixteen years old, and a still younger daughter. 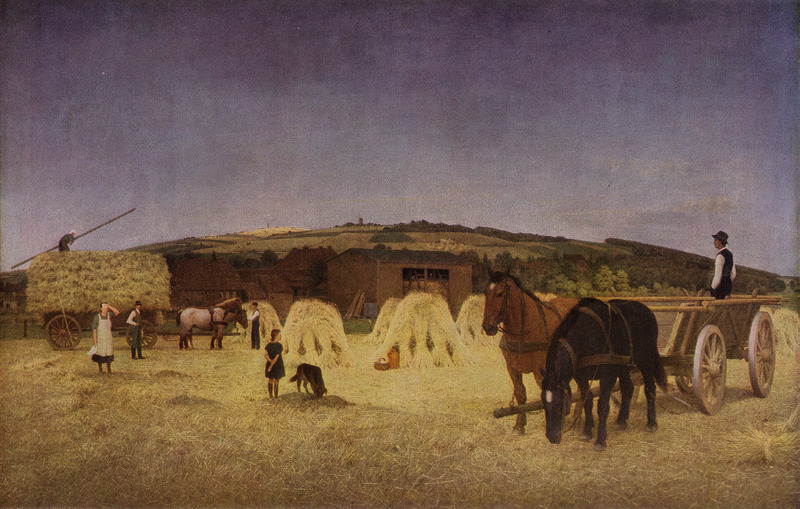 The management of the farm was immediately taken over by the most capable of the Heuerlings in conjunction with the widow, and this joint regency was working so successfully that there seemed to be no danger that the farm would run down before the heir was old enough to take matters into his own hands. The most vivid recollection I have of a Heuerling’s home is one I visited late one afternoon. Darkness had already fallen as my motor struggled up a muddy, rutty lane and finally stopped before a small farmstead redolent of age. The gatelike doorway opened to our knock and I found myself in a curious house-barn interior where a cow gazed tranquilly from its stall into a tiny kitchen across the way, and where chickens roosted in surprising places. This strange household was dimly lit by a few oil lamps which threw a mellow sheen on beams and walls nearly three centuries old. The Heuerling, a hale old man and his equally hale wife, greeted me without the slightest trace of self-consciousness. I had come at a good moment, he said, for he had something interesting to show me — the pig he had long been fattening and which he had slaughtered that very morning. Visibly swelling with pride, he led me to the rear of the house, and I mentally agreed that his pride was justified, for it was certainly a mammoth porker. As the great carcass, immaculately dressed, swung gently from a beam in the ceiling, it bulked enormous in the dim light. I was told it weighed nearly five hundred pounds, and I do not think the man exaggerated. Such, briefly, is the old Heuerling system, and the homes and human types it produces. It is interesting to note that the German Government is actively fostering this system and seeks to extend it further afield, with such modifications as new circumstances call for. Wherever a large or middle-sized farm needs more regular labor, the Government offers to loan the proprietor about two-fifths of the cost of building a Heuerling house, the loan to be repaid over a considerable term of years. Such houses as I saw were not of the old type. They were severely practical two-story affairs, with no room for animals, though with ample cellar space for storing vegetables and preserves. Built solidly of brick, tile, and concrete, they appear to be fireproof throughout. Except for a small kitchen-garden plot they have no land attached to them, but I am told that the proprietor is bound to furnish certain amounts of meat and other foodstuffs. Rental contracts run for a year. The terms vary according to the kind of employment. One man whose home I inspected was a professional milker, brought down from Friesland. He naturally has no time for anything but his cows, so his contract calls for an almost wholly cash wage. This young man and his sturdy little wife were un-disguisedly proud of the new home they had just furnished. The furniture, though plain, looked of good quality. They told me that most of it had been paid for out of the l,000-Mark ($400) loan which the Government will make to any healthy young couple at the time of their marriage. It is to be repaid in small installments, but one-fourth of it is canceled every time a baby is born. So a prolific couple should not have to repay very much. The Government seeks in every way to tie these new settlers to the land and make them into Heuerlings of the old school. One of the most striking inducements which it offers is a sort of long-service bonus. After a man has served satisfactorily for five successive years, the Government offers to make him a gift of from 600 to 800 Marks if he will sign a five-year contract with his employer. Although these attempts to extend and modernize an age-old system have been inaugurated too recently to yield much evidence as to their success, they constitute an interesting experiment in agricultural labor relations. How are the Nazis faring in their Battle of the Land? That is a complex question, hard to answer. Personally, I examined in detail only one sector of the “agricultural front,” and was presumably shown the best of that. However, we have some definite information, and I supplemented this by discussions with Germans and qualified foreign students of the problem. The Third Reich does not seem to be in any immediate danger of actual starvation from the British blockade. At present rations, there is enough grain, meat, potatoes, and other stock vegetables including beet sugar to last for at least two years. [Footnote: This was written on the basis of what I could learn in Germany down to my departure in January, 1940. I have since had information that the record cold during the winter months froze and spoiled vast amounts of stored potatoes and other vegetables. This point and its possible effects are discussed in Chapter XXII.] 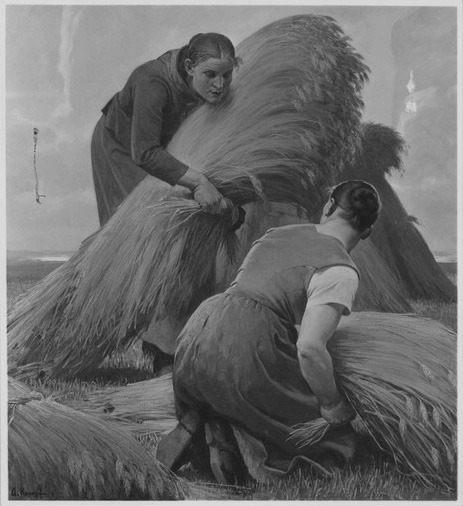 The German grain crop for 1938 was 27,430,000 tons — about 2,000,000 tons over normal consumption. The amount of the grain reserve is secret; but it is known to be very large. Estimates range from twelve to eighteen months. Also, Germany can import grain in quantity from Hungary and other parts of Central Europe; possibly also from Russia, especially as time goes on. The last German potato crop was 56,300,000 tons, of which less than one-third is needed for human consumption, despite the wartime shift to a potato diet. The balance goes chiefly for feeding pigs and distillation into alcohol, used largely for commercial purposes and for mixing with motor fuels. There is an abundance of sugar beets, likewise an excellent animal feed. Cabbage, turnips, and other vegetables are all in satisfactory shape. Germany has a growing number of hogs — a vital source of fat as well as of meat. Hogs do well on a diet of sugar beets and potatoes. The last hog census for Greater Germany showed 28,613,000 porkers, an increase of no less than 53 per cent over December, 1938. Cattle herds number almost 20,000,000. Even under the worst conditions, that should furnish a lot of milk, and of meat at the present ration — one pound per week per person. That is the bright side of the picture, from the German point of view. But we have already discussed the dark side — a crucial lack of fats and other shortages which result in an unbalanced diet injurious to health and strength over a period of time. The German people is today on iron rations. They cannot be notably reduced without disaster. Can they be maintained for years at their present level? The answer to that question depends on certain long-range factors, especially the efficiency of the present agricultural system and the temper of the farming population. The Nazi regime has established a highly complex economic structure with fixed prices all along the line. Agriculture has been basically socialized. To be sure, the peasant owns his land and has been protected against heavy loss, but he is no longer a free agent. He must grow what he is told and sell at established rates. He is virtually tied to the soil and his initiative is narrowly circumscribed. Economic security has been coupled with rigid state control. For the first few years of the Nazi regime, the peasant probably gained on balance. But with the introduction of the Four Year Plan toward the close of 1936, agriculture ceased to be the White-Haired Boy. An intensive rearmament program coupled with colossal reconstruction projects had first call on both capital and labor. This imposed serious handicaps upon agriculture, which the war tends to intensify. One of these is a farm-labor shortage. At the annual Peasant Congress in December, 1938, Minister Darré admitted that there were 400,000 fewer workers on the land than when the Nazis came to power, and the deficit is probably much larger than that figure. Furthermore, we must remember that this is only part of a general shortage of labor in every phase of Germany’s economic life. 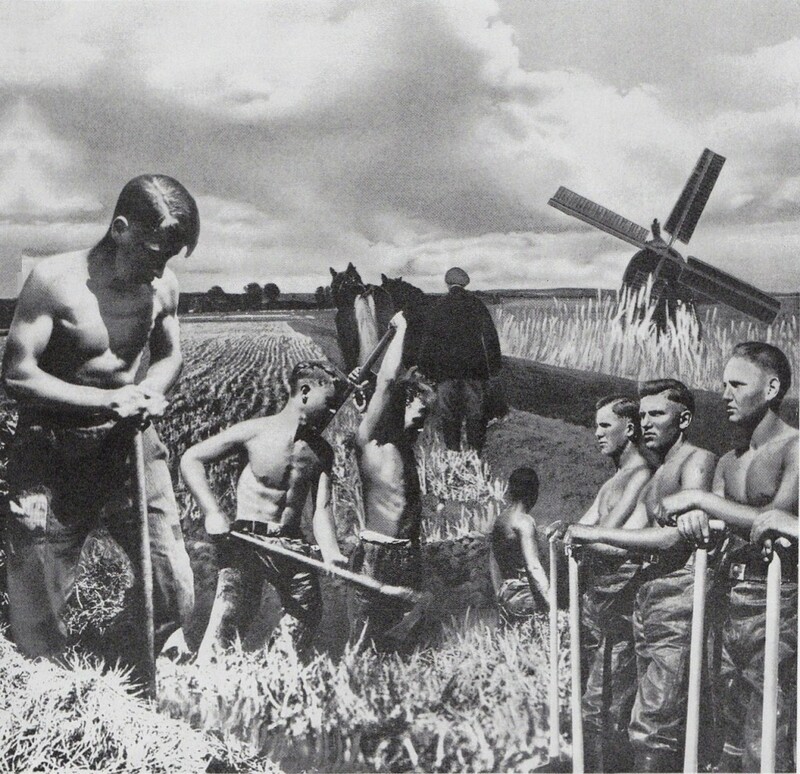 The Government is striving to overcome this by compulsory labor service for young men and women, and it has promised that 1,000,000 Poles would be imported to work on German farms. It remains to be seen how efficient such amateur or conscript labor will be as compared with seasoned farm workers. Recently the Government raised the prices of milk and butter as avowed incentives to the farming population. No such disturbance of its nicely balanced price system would have been made if the need for such action had not been urgent. The Battle of the Land thus goes forward. What the outcome will be, only time can tell. The food regulations today in force assure to the poorest German the basic necessities of life while the richest cannot get much more than his share. So long as the German people believe that the system will enable them to keep above the hunger-line, there seems to be scant likelihood of a popular revolt over food alone. Herr Darré’s statement has a two-fold significance. It shows both the economic advantages of wartime rationing and its steadying effect on the popular state of mind. This second aspect is perhaps the more important. In the World War, the old Imperial German Government did practically nothing to control food conditions during the first two years of the struggle. The result was a vast deal of hoarding, profiteering, and a general skyrocketing of prices. Rich families laid in big stocks while poor men went hungry. These obvious injustices did more than anything else to rouse popular resentment and promote revolutionary unrest. It is well known that civilian morale broke down long before that of the soldiers at the front. Also, this civilian breakdown ultimately infected the armies in the field. The Nazi leaders are keenly aware of all this and are determined that it shall not happen again.